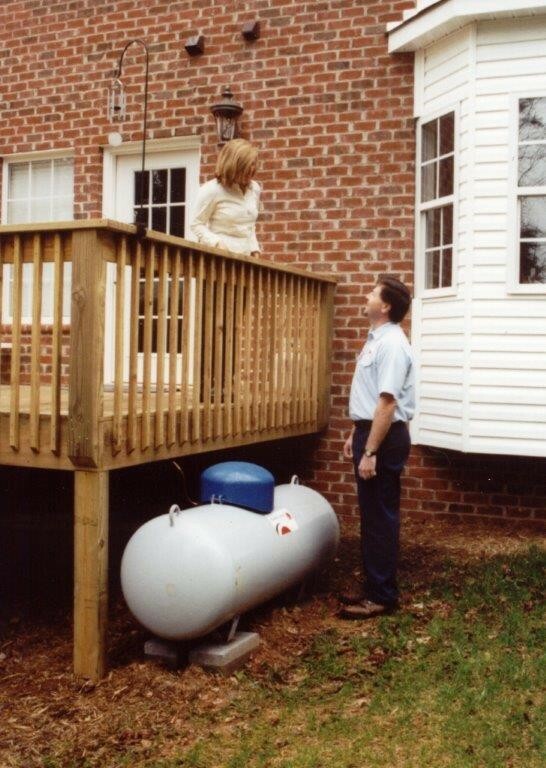 A 500 gal propane tank is perfect for heating entire homes, and to heat hot water for bathing or for swimming pools. 500 gal propane tanks are also used for businesses such as heating, cooking, dry cleaning, and crop drying. The tank is usually around 3 ½ feet tall and 10 feet in width. It is usually the right size for homes between 2500 and 4500 square feet. Propane has countless benefits. It is affordable, clean-burning, and plentiful. To refill it, simply lift the lid on the tank and check the gauge. When it's at 20-30 percent full, call your propane dealer to come out and refill it for you. Propane is odorless, so a smell is added in case of a leak, you will be alerted. Using a regulator is a must with a tank this size. It reduces the pressure of the tank to a pressure suitable for use.